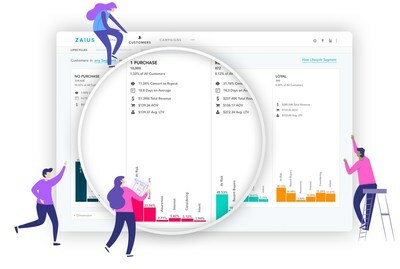 BOSTON, March 26, 2019 /PRNewswire/ -- Zaius, the architect of Assisted Marketing, today unveiled Zam, the data science-powered marketing assistant that supercharges the award-winning Zaius customer relationship management (CRM) platform. Zaius is the only CRM to provide the visibility of a Customer Data Platform, the cross-channel campaign functionality of a next-gen Email Service Provider, and the intelligence of data science. Zam is the industry's first automated marketing assistant that translates the power and intelligence of data science into assists - a new kind of pescriptive and directional guidance - to optimize marketing programs and inject relevance into customer relationships. Zam uniquely trains itself on each brand's data, doing the heavy lifting of surfacing opportunities, automating tasks, and streamlining execution, so marketers can efficiently realize their potential. "From CRM to paid media to site merchandising, Zam empowers my team to plan for success and pivot quickly to capitalize on 'hidden gems,''' said Sam Wilson, Senior E-commerce Marketing Manager, Richer Poorer. "It reveals layers of marketing and business intelligence that we don't get elsewhere." Predict Customer Behavior: Marketers can anticipate each shopper's likelihood to purchase in real-time, and seamlessly launch behavioral triggers. Predicting each shopper's behavior provides a clear path to more relevant messaging throughout the lifecycle. Uncover Hidden Product Opportunities: Zam helps marketers and merchandisers uncover product opportunities by knowing and understanding which products are performing well and which are not. Zam surfaces promising products based on a customer's previous behavior and current intent, allowing you to re-merchandise the right products to the right shoppers. "There is no 'one-size-fits-all' predictive model. To inject true value into a brand's relationship with its shoppers, models must adapt to your unique business and continue to learn as they gather more data," emphasized Spencer Pingry, Zaius founder and CTO. "Zam leverages a brand's event level stream of customer interactions including product detail views, promotional offers, content viewed across channels, and more. We take care of data science so that you can take care of your customers."